Fresh Look. Fresh Flavors. The New and Improved Lodge Dining Room. Our newest dining venue, the Lodge Dining Room, will hold its Grand Opening for a Good Cause, Friday, May 18th, 2012. Donating proceeds of dinner and wine sales to Bridges of Hope, a nonprofit organization that links families to community supports and resources, the event is open to both resort members and the general public. Featuring a tasting menu of a variety of flavors including: Wild Acres Smoked Pheasant Salad, Star Prairie Rainbow Trout, Braised Bison ribs and Blue Gill Chips as well as dessert, the cost is $60 per couple. Furthermore, a “wine pull” for $10 per cork will offer attendees the opportunity to win a variety of bottled wine ranging in prices. If interested in celebrating the Lodge Dining Room’s Grand Opening for a Good Cause, please call 218-963-8756 for reservations. In 1916, the first guests arrived at the Historic Grand View Lodge. Back then families came to escape the city life and unwind. Today, almost 100 years later, our guests still seek that same tranquility, returning again and again to relax, slow down and create a lifetime of memories. The original craftsmen who built the lodge (1918-1921) made it a haven for the weary traveler with the dining room being a lodge centerpiece and the main eating area for guests. 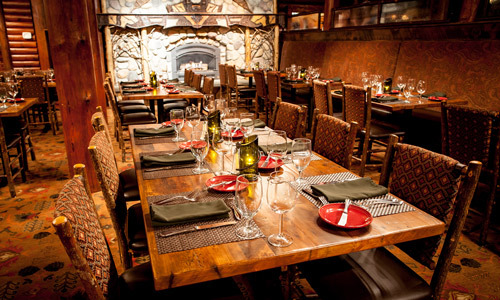 So when it came time to renovate the dining room in 2012, careful not to disturb the historic integrity of the space, the remodel included designers and craftsman that could easily replicate and preserve the ambiance, seamlessly blending with the property’s nearly century old lodge. In keeping within the guidelines of the National Registry of Historic Places, the Hearth Room Design Group of Brainerd envisioned and designed the millwork and furniture to blend seamlessly with our nearly century old lodge. 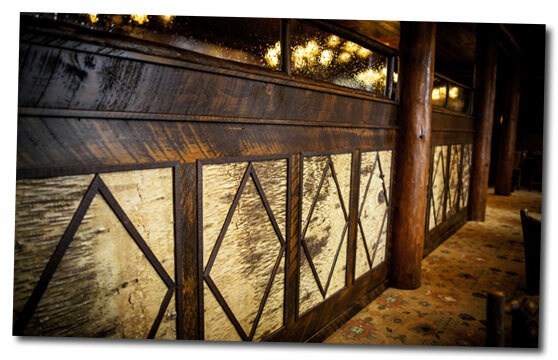 Next, we commissioned Northshore Wood Products of Duluth, Minnesota, a company which specializes in historic lodge renovations, to create our vision and maintain the rustic surroundings of the Grand View Lodge experience. Northshore selected reclaimed white pine from the Peavey grain elevators in Superior, Wisconsin. When the elevator was constructed in 1878, the builders used 300 to 400 year old white pine from the surrounding forests of northern Minnesota. Though the renovations are new, Northshore’s craftsmanship paired with this old growth reclaimed timber maintains the time-honored traditions of yesteryear. Barry Nelson, artist and owner of Bear Rustic Furniture in northern Minnesota, was commissioned to recreate the focal point of the dining room, the fireplace, as well as produce picture frames that kept in theme with the rest of the room’s historical features. Using alder sticks and different colors of birch bark, both the fireplace and frames have the same style. Adorned with intricately placed pine cones designed in different patterns and a mantel clock made with walnut woods, birch bark and sticks, the frames and center point fireplace set the tone of the room, giving it the same rustic, up-North cabin comfort finish that encompasses the entire property. 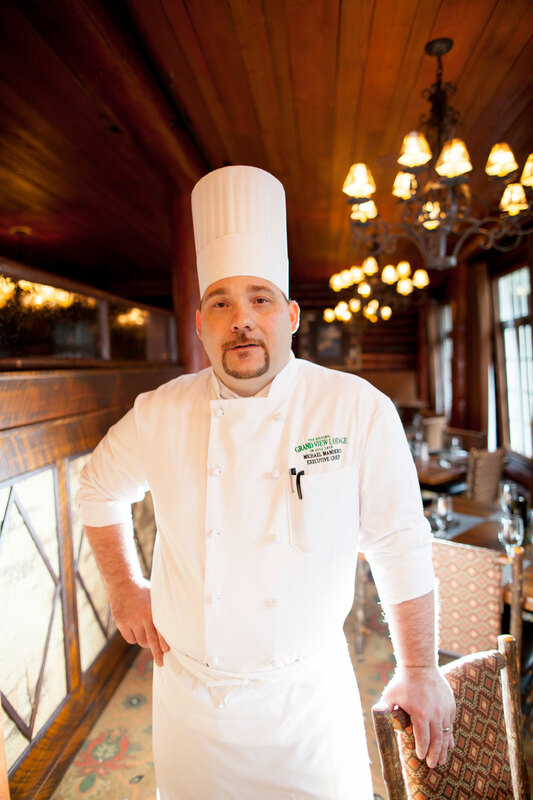 Executive Chef Michael Manders runs all eight dining venues at Grand View Lodge collaborating with all his chefs on menus, flavors and presentation. Take in the Historic Grand View Lodge, where old and new are seamlessly combined to give our guests the authentic Northwood’s experience. Relax…sit back… and enjoy the grand view.